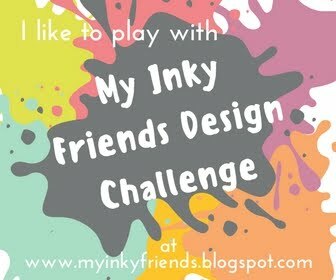 Welcome to my stop on the Inky Friends In Color 2017-2019 Blog Hop. 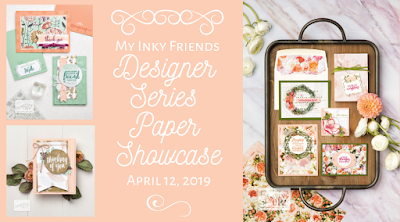 Each blog in the loop showcases one of the new In Colors, and I am featuring Tranquil Tide as my guest post on the Inky Friends Blog! You may have come from Mickey's post featuring Powder Pink or you may have come backwards from Betty's post featuring Berry Burst. For my projects I am featuring Tranquil Tide and the Soft Sayings Card Kit. This kit even has a refill available! I added 1 sheet of Tranquil Tide 8-1/2 x 11 cardstock to make the cards seen here and used nothing else but what came in the kit. For the first card, I also did a “CASE of the Catty” with the card shown above right, which is found on p. 220 of the 2017-2018 Stampin’ Up! Annual Catalog. This card uses just the front of one of the folded 4-1/4 x 5-1/2 cards from the kit as the base. (I cut off the white back to use on a project below.) There is a layer cut from the Tranquil Tide card stock and the part that opens is a folded 3-1/2 x 5 card from the kit that I trimmed down. The Soft Sayings Card Kit offers so many fun embellishments. The card came together in a jiffy! in the Soft Sayings Card Kit to create a fun pop-up element! This was inspired by Lyssa Zwolanek. The last card is made with one of the folded 3-1/2 x 5 cards from the kit. On the front, I made a pocket out of the rest of the envelope from above. I scored on each side and folded the sides to the back, adhering the pocket to my card front. Tranquil Tide cardstock at 2-5/8 x 4-3/8. For the tag topper, I folded over one of the die cut labels from the kit, punched a hole at the top, and finished with the fun baker’s twine that is included. Option 2 shows sliding a gift card into the front pocket for a fun surprise. The inside uses two of the leaf accents to set off the “Congratulations” wish. I hope that you can see how much fun it is to create with this new card kit! It is great that it coordinates with Tranquil Tide, my favorite of the 2017-19 In Colors! By adding just one sheet of cardstock to the kit components, I was able to come up with more ideas than even the 10 that SU! has already designed for you. Next up on the hop is Berry Burst by Betty. I can't wait to see what she has whipped up for us. Of course, if you are hopping backwards, you can check out Mickey's Powder Pink Post. 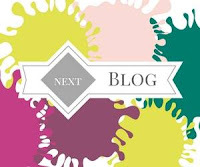 New 2017-2018 In Color Blog Hop Coming Your Way! We're hopping again. This time we are featuring the 2017-2019 In Colors- Fresh Fig, Berry Burst, Powder Pink, Lemon Lime Twist, and Tranquil Tide. There are two hostesses for each color, so be amazed by all the creativity you'll see! Here is our hop order.